Plane of Origin – Mechanus. It begs the question, what can break a creature of law? 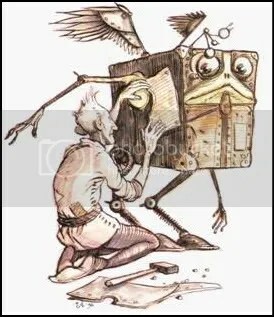 Modron are inherently a collective, studying all that the planes has to offer and cataloging it for some alien purpose. Along the way, something “reconfigures” a modron’s mind and they lose their original purpose. These Modrons are considered “rogue” for abandoning protocol and seeking out a new mission in life. Slight Unease. This newfound sense of self can be anxiety inducing upon a Modron, especially since their former collective will try to hunt them down. Rogue Modrons have advantage on Wisdom (Perception and Insight) skill rolls. While often mistaken as Mimirs, these creatures were simply warriors and mages preserved beyond death. Unlike the Lich, they don’t rely on the draining of souls and function much like a living creature. While not overly useful, the floating skull can improve itself over time, whether through training or magic. Plane of Origin. Sigil, the City of Doors. These floating skulls happen from mad necromancers doing whatever they can to preserve a friend who suffered terribly in Sigil. The infamous skull collector known as “Lothar” created this technique. Quasi-Undead. Unlike a true undead, the floating skull can be affected by healing and cannot be turned. However, it doesn’t need to eat or drink. It must, however, rest. Skull Slam. Melee Weapon Attack: +4 to hit, reach 5ft., one target. Hit: 5 (1d6 + 2) bludgeoning damage. Piercing Bite. Skull Slam. Melee Weapon Attack: +4 to hit, reach 5ft., one target. Hit: 5 (1d6 + 2) piercing damage. Litany of Curses (1/Day). The skull companion utters out foul blasphemies and distasteful swears against a target, sending them into a frenzy. One creature capable of hearing the skull companion within 30ft. must make a DC 14 Charisma saving throw. Upon failure, the creature must use all movement and actions to focus on attacking the skull companion with unarmed melee. On top of that, they attack with disadvantage. This effect lasts for up to 1 minute or if the creature succeeds its next saving throw at the end of its turn. This does not affect creatures immune to charms. Rolling Skulls (1/Day). The skull companion can call upon help from other skull companions in the multiverse. The companion can place a 10ft. by 20ft. line within 30ft. of it, causing all creatures to make a DC 14 Dexterity saving throw. Targets who fail take 10 (3d6) bludgeoning damage and fall prone. Targets who succeed take half damage. This unholy fusion of chaotic magic and technology has resulted in a creature of pure radiance, with an abnormal hatred for any creature not composed of pure energy and glowing splendor, such as itself. The figure itself is The Light Blight is an unnatural race, bent on converting all matter into raw energy. It can usually be found docking on some source of technological energy. While it doesn’t require this for survival, it does this as a comfort mechanism. Despite this strange behavior, the glowing orb has supreme intelligence and manipulative skill. Plane of Origin. Prime Material – Arothe/Quasielemental Plane of Radiance. A material world infamous for its dealing with the planes and the cosmic. One such incident resulted in an alien space station teleporting inside of a mountain. The chaotic magics of the region seeped into the broken technologies and created a luminescent creature hellbent on destroying all non-elemental life. This creature has succeeded in escaping its prime material prison, reaching new realities through the plane of radiance, where it has used the energy of the realm to help create more of itself. Should it escape into the known multiverse successfully, all life could be vaporized. Bright Light. The Light Blight sheds a bright out out in a 30ft. radius and a dim light for an additional 30ft. Magic Resistance. The Light Blight has advantage on saving throws against spells and magical effects. Obvious. The Light Blight is incapable of hiding, as it will cast a glow on whatever is touched, usually damaging it. It suffers disadvantage on Dexterity (Stealth) checks to hide. Searing Radiance. Any creature that touches the Light Blight or hits it with a melee weapon attack within 5ft. takes 5 (1d10) radiant damage. Multiattack. The Light Blight may attack with Radiant Blast up to two times per round. Radiance Blast. Ranged Weapon Attack: +8 to hit, range 60ft., one target. Hit: 13 (2d8 + 4) radiant damage. Corrosive Blight Touch. Melee Weapon Attack: +8 to hit, reach 5ft., one target. Hit: 7 (2d6) acid damage plus 18 (4d6 + 4) radiant damage. The target must make a DC 16 Constitution saving throw or take 1 level of exhaustion. Exhaustion dealt in this manner lasts until the creature completes a long rest or has it removed through other means. Terrifying Light (Recharge 5 or 6). All creatures within 30ft. of the creature must make a DC 16 Wisdom saving throw. Any target that fails takes 27 (6d8) psychic damage and are frightened and blinded until the end of their next turn. Targets who succeed half damage. Creatures immune to charm or frightening effects are not affected. *The language of Greys. Should you prefer to NOT have aliens be a part of your world, this can be substituted out for another language, such as Gith. 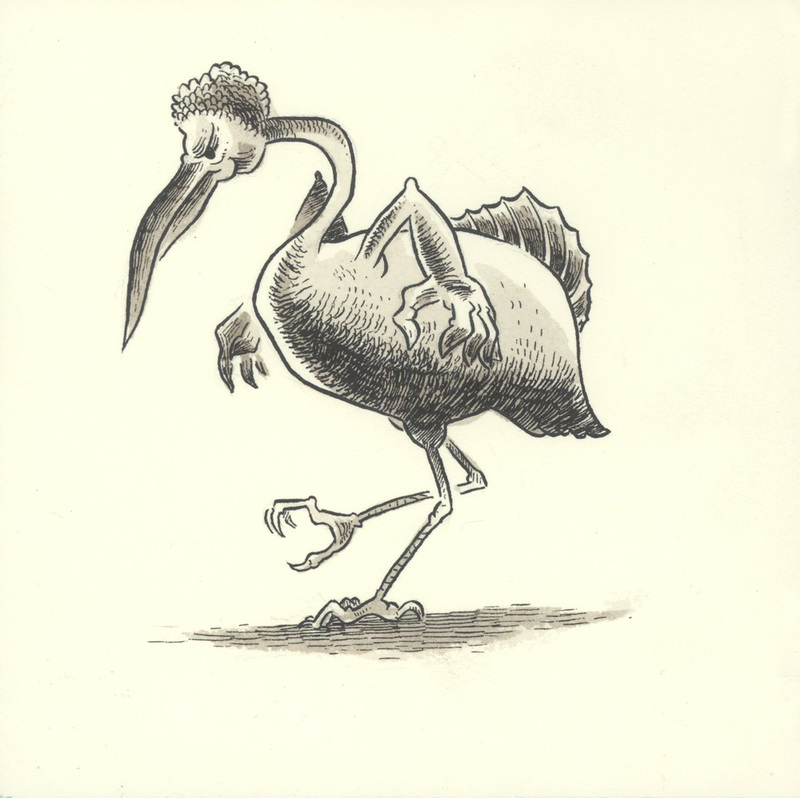 Fiendish bird-like creatures, they revel in ganging up on whatever unfortunate victims get too close to their masses. By themselves, they are quite cowardly and pathetic though. Their features make them prone to mockery. However, it is rumored that comparing them to a chicken will set them off. Plane of Origin – The Grey Wastes/Demiplane – Baba Yaga’s Dancing Hut. Their original incarnation is one of many foul spawns of the Lower Planes. Heavily overshadowed by the more neutral engines of destruction known as the Demodands, the neutral schemers that are the Daemons, the lawful Devils and the chaotic Demons; these lowly souls wallow in their own ensnared muck that is Hades. Some might take advantage of some ensnared adventurer facing off against other fiends of the plane joining them for violent fun. Other than joining their own or being an opportunist, it’s rare to see them directly engage in an already hostile environment… usually unfortunate Blood War recruits. However, in the case of Baba Yaga, this incarnation is slightly different. These were creatures morphed by the Hag Queen’s wicked curses, into a similar fiendish horror. Why she does this? Likely a security measure against outsiders, in hopes of keeping prying eyes outside of her wandering hut. Enfeebling Dance (Recharge 6). When with at least three other Diakka capable of using this ability, the creature may perform a hypnotic dance around a creature by circling around it with their movement. This does not trigger opportunity attacks, even from specific features. The subject must make a DC ## Wisdom saving throw. Upon failure, any damage dealt by that target’s weapons is halved for up to 1 minute. They may attempt a new saving throw at the end of their turn. Creatures immune to charms are not affected by this. Bite. Melee Weapon Attack: +4 to hit, reach 5ft., one target. Hit: 8 (1d12 + 2) piercing damage. Claws. Melee Weapon Attack: +4 to hit, reach 5ft., one target. Hit: 7 (2d4 + 2) slashing damage. Exhaustion Blast (1/Day). Ranged Spell Attack: +5 to hit, range 60ft., one target. Hit: 9 (2d8) necrotic damage. Targets must make a DC 13 Constitution saving throw or gain 1 level of exhaustion. Successful saves cause half damage. Grotesque Mimics of the Humanoid Form, composed from clay. Neither golems nor mimics, these creature try to emulate the forms of various people and beings, but ultimately fail to do so. This fact enrages them, but they try to blend in with others in futility, until someone unwittingly singles them out. Once that happens, a bloodbath occurs. Plane of Origin – Elemental Plane of Earth/Demiplane of Dread. Originally conceived by natives of the plane as a means of interacting with other planes, these creatures were meant to be emissaries and diplomats, acting as a unity between Elemental Earth and the realms beyond. However, something in the process went wrong and its creators went mad. The result was a series of unintelligent and brutish creatures that failed to emulate the creatures they were meant become. The creators promptly abused them until they “got it right”. This ultimately scarred and angered the creatures, causing them to turn on their masters. The pseudo-shapeshifting clay people then fled in search of a home that would accept them. However, their anger and fear ended up hurting them far more than their flawed abilities. One of the places they found themselves in was a strange realm of progressive sciences. Ultimately, they became the tools of a corrupt professor seeking to rival a creator of flesh golems. When a strange mist engulfed the land, they were stranded in a demiplane of horrors, where their plights only grew worse. And even worse, the mists themselves seem to take joy in creating more of them. Eyes of the Earth. While they can see like normal humanoids, they’re also able to sense through feeling via tremorsense. Temper Tantrums. These creatures are easily set off. This is usually done by reminding them that they aren’t they’re different or fail to be the creature they wish to emulate. As their logic is quite basic, the littlest thing can trigger their rage. Hot Hardening. When the Clay Mockery takes fire damage, it must make a DC 12 Constitution saving throw. Upon failure, it loses 5 feet of its speed. If its speed becomes 0, the Clay Mockery dies and becomes a solid statue. Reckless. The Clay Mockery can lash out with mindless ferocity. During its attack action, the Clay Mockery can choose to give itself advantage. However, after it has resolved this action, it grants advantage against all other attacks until the start of its next turn. Sticking Clay. Creatures that make a melee attack against the Clay Mockery must make a DC 16 Strength saving throw. Upon failure, they become stuck to the creature. They are incapacitated and their speed is reduced to 0 feet until escape with the Escape Action. The DC is 16. Slam. Melee Weapon Attack: +8 to hit, reach 5ft., one target. Hit: 19 (4d6 + 5) bludgeoning damage. The target must make a DC 16 Strength saving throw or become grappled as well. Poor Mimicry. The Clay Mockery may use its action to take the form of a humanoid. However, the end result is always botched and looks clay-like. A DC 14 Perception check reveals the creature. Planescape and Spelljammer are properties of TSR/Wizards of the Coast. Planescape Torment is property of Black Isles/Interplay/Beamdog. Made by Doctor Necrotic, for Doctor Necrotic media. All rights reserved.